A neighbor gave me a Sherwood S-2000II. When I connect it to an amplifier it creates a loud AC hum in the amplifier. 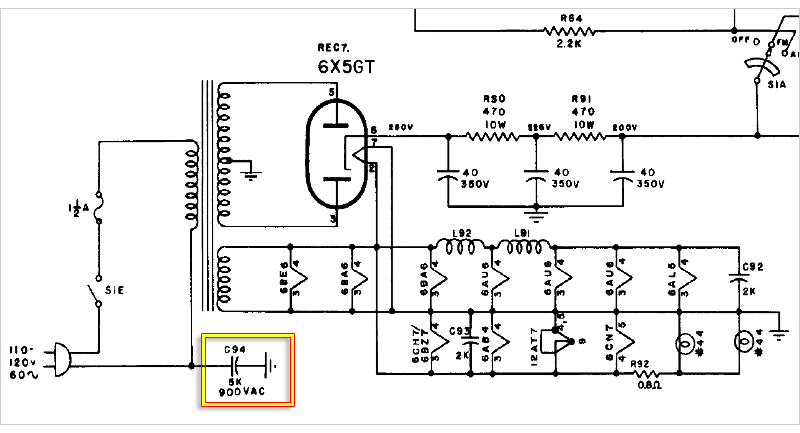 I looked at a troubleshooting page and have determined it is a ground loop problem. but they did not indicate how to fix the problem. I reversed the a/c plug, but that did not good, hum is there no matter which way I plug in the power cord. Any Ideas? Maybe connecting a ground wire from the tuner to the amp? These can be found on ebay for ten bucks or less. That won't work because the shield conductor of the RCA cable is already connecting the "ground" between the two units. The device Greg above should work. If either or both units have been modified with 3-prong power plug, "lift" one ground with an adaptor like this may work. Maybe the tuner chassis is hot due to a defective capacitor. I don't know about the S-2000 II version but in the S2000 there's is a 5 nF cap between the incoming AC line and chassis (also rightly called "death cap"). If such a cap is present in your tuner cut it out completely and don't replace it. Another thing to check: what kind of antenna are you using ? Is the hum still present when you completely disconnect the antenna ? 5nF (nanofarad) Capacitor mentioned by Tubologic. Wait for the ...processing... notice to change to Get Manual ←it takes a while! Can you control the level of the hum with the volume control on the amp or is it at a fixed volume regardless of the control's setting? Can you hear stations along with the hum? If it is a controlled hum there could be an open shield connection at one of the RCA plugs or at the jack, itself. Try connecting a separate ground wire to test for this. Otherwise, you may have one or more bad filter caps in the tuner's power supply. If it is a fixed level hum, some of the other suggestions may apply. Remove the 6X5 tube in the tuner, then it should be silent. If that gets rid of the hum, you actually have bad filter capacitors, not a ground loop. The Capehart 400 series, at least in my 413N, has a 10 ohm resistor in the chassis ground circuit between the tuner chassis and the power supply/amplifier chassis to eliminate a possible ground loop. This might work for you. Just a suggestion. Good luck! If both the tuner and amplifier have power transformers then it is unlikely your problem is due to a ground loop. More likely is absence of a ground. You might try adding a 39 ohm or so (not critical value) resistor in the audio cable ground line. It stops inductive currents in the shield that can cause hum. Double check your audio patch cable. I just dealt with this connecting my tv to my stereo receiver. The RCA plugs and jacks oxidized and the shields were ineffective. I sprayed de-oxit in the jacks and applied anti -oxidizer compound to the plugs. Good move, but it may leave an even more effective hum loop! I recently fixed a weird hum between my cable TV audio and the separate stereo system... it was from the RF cable shield to the set-top box! I added 39 ohms to the RF cable shield... hum fixed! This is the easiest check of what is very often the cause of hum. At least doing this eliminates the filters as suspects.